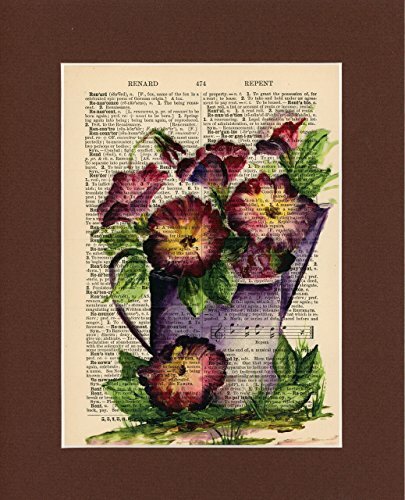 Vintage Dictionary Art Print-Purple Poppy Anemone Flowers (Ranuncula) by Sun City Art at Tecac. Hurry! Limited time offer. Offer valid only while supplies last. DESCRIPTION--Sun City Art matted mixed media print on vintage, authentic, upcycled dictionary page using reproductions of our original oil paintings. DESCRIPTION--Sun City Art matted mixed media print on vintage, authentic, upcycled dictionary page using reproductions of our original oil paintings. Our prints are beautiful and iconic, adding to the character of any room. Each print is on a different page of upcycled dictionary paper, so each print is unique. Product is custom matted and ready to frame, printed on recycled vintage dictionary paper. This is an 8"x10" - Matted Mixed Media Poster on Vintage Upcycled Dictionary Page *FRAME NOT INCLUDED** :: FREE SHIPPING :: Each print will be packaged in a clear plastic sleeve with sturdy cardboard for shipping. If you have any questions about this product by Sun City Art, contact us by completing and submitting the form below. If you are looking for a specif part number, please include it with your message. Three Piece Nursery Cardstock Prints 8.5 x 11 "Simple Woodland Animals"
Three Piece Cardstock Prints 8.5 x11 "Bernese mountain dog"
Two Piece Cardstock Nursery Prints 8.5 x11 "Colorful Teepee"
Three Piece Nursery Cardstock Prints 8.5 x11 Pink and Teal "Woodland Animals"
Three Piece Nursery Cardstock Prints 8.5 x11 Pink and Purple "Woodland Animals"
Three Piece Nursery Cardstock Prints 8.5 x11 Pink and Turquoise "Woodland Animals"